My memories start with seeing Blow at High Dough on a video show. Then it was New Orleans is Sinkin’. Then Road Apples. I was aware of the first single form the EP but it didn’t bend my mind like Up To Here and Road Apples. I recall sitting at my desk in my room in grade ten, studying while listening to Road Apples. Instead of studying I was learning the entire album on my little red strat. Then I recall my Dad driving a few of us to see The Hip at the Aitken Centre in Fredericton. I recall standing on the floor not far from the stage and loving the great show they put on. I saw The Hip three times that I can recall. Sort of early, middle and late. The middle show was in Saint John with Plasket opening. Gord was heavy into his ranting and raving thing then. To be honest it turned me off. It just went on too long for me. I wanted the songs. Now, don’t mistake that sentence to mean it wasn’t good. Just because it didn’t move me or I didn’t like it or I didn’t get it, doesn’t mean it wasn’t good. Gord was then and certainly is now, one of the great front men of all time in rocknroll. Anywhere. Period. There’s more to fronting a band than just writing good words and being able to sing. Certainly Gord is one of the great writers. I also think he is an amazing singer. It may not have been until this last time I saw them, only weeks ago in Calgary, that I realized how great a singer. Huge range. Great cadence. Nimble. But again, that alone doesn’t cut it. He understands performance. It’s not just about standing there and delivering the song. He is entertaining. He is telling a story PHYSICALLY. He is in a unique stratosphere of front men in my books. Gabriel. Mercury. Jagger. Yes. That kind of company. The start of the First Saddledome show on the “Man Machine Poem” Tour was intense. They were all huddled together. Close. A drum kit sat in front of another. Pedal boards were tightly snugged against mic stands. They could easily reach out and touch each other. It was like they were opening for themselves. Sure enough, after a 40 minute set they took a pause. The roadies stretched out the gear. The first drum kit was taken away and the larger kit behind was set for action. A wardrobe change. More space for the electric Downie to do what he does. It was on. They repeated this sort of mini set a few times throughout the night. Each time their roadies slightly altering the space on the stage. Subtle, yet interesting, detail. I didn’t expect the third song to be Fiddler’s Green. I figured I would lose my composure but perhaps not until the encore. Third song in and I was in full on ugly cry mode. A powerful tune. The band never once showed weakness. Throat punch after throat punch The Hip did what they have always done. Delivered. 30 years is a long time for a group of people to stay together. Let alone create art as a unit. I can’t imagine how tough it has been. The ups. The downs. While they have had many different sounding albums over the decades they have somehow always sounded like themselves. 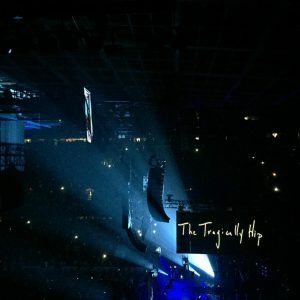 There is an underlying commonality where you know, when the needle hits the groove, that it is the unmistakable sound of the Tragically Hip. Whether it’s the blues rock of the first albums. The sonic palate of Day for Night. The modern crispness of Music at Work or World Container. Or even the latest, Man Machine Poem. Once thing holds true. You KNOW it’s The Hip. That is a unique place to be in for a band. To be able to retain your identity but not be locked to it. Stretch out. Explore. Reach deep into the mind. The dark corner of your heart. The cold despair of where your hardened honesty lives. It’s in there. Pretending it’s not doesn’t change that. The truth is not dependent on your belief in it. Some performers sing the songs. Some performers deliver the goods as they are. Others explore. Live deep in the moment. Go with the little voice. Try this, it says. You do. Sometimes it works. Sometimes you fail. Either way, something is learned. When I watch Gord Downie perform it is clear to me that he is in the moment. Ready to offer up whatever the little voice compels him to do. To go beyond the comfort zone to give you, the audience, a unique experience. Over time we have become a unit. We have allowed, accepted and encouraged that kind of performance and in turn, Downie has reached down, dug deep and given himself and beyond to 120 + minutes on stage each night. This is not an easy feat. Most people would be scared. So much so, that they would tell themselves, “oh no, I can’t do that. People might laugh or not like me”. Ignoring that voice is brave. Being ones true self in spite of persecution is brave. That is truly living folks. 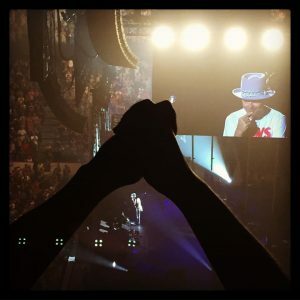 What we are seeing in the past few months is a whole other level of what Gord Downie is made of. It’s like his bravery took steroids. Instead of hiding at home or becoming a recluse to maximize whatever time is left, he has done what he always did. Hit the stage with 100%. This time though, armed with a powerful new weapon. The very real, and likely, possibility that this is the last time he’ll stand on stage in each of these cities. Watching him in Calgary was beyond moving. Inspiring. Transcendental. So many people in Calgary and the other cities they play, are a part of a unique thing. Watching a man, and a band, say thank you and farewell. “Thank you. for Everything”, Gord said as he alone circled the stage waving to his support group. “Use it up” he advised. Good advice. On August 20th, 2016, a once in a life time experience will happen in Canada. Thousands and thousands of people will take part in the same moment. During the CBC’s broadcast of The Hip’s “final” show, regardless of where you are…at the show, in a park watching on a big screen, in a bar drinking $2.50 high balls, on your computer, in your room on your phone or maybe you’re some place where you can’t watch it but you can take a moment to feel during that time…nothing like this will ever happen again in our lifetime, if ever. A Nation, brought together by the courage of a group of men, to say farewell to one another. To say thank you. This is a truly unique moment in life. Oddly it is death that has brought us this wondrous opportunity. That avoided one thing we all share. The taboo topic. The fearsome end. That thing we never want to talk about. Well now we all have someone to help us talk about it. Someone is showing us what it’s like to be brave. To be honest. That it’s ok to be afraid. Maybe you can’t be brave without being scared. I’d like to be clear that this is not a eulogy for Gord or the band. They are still with us. This just me trying to make sense of my thoughts and feelings during this tremendous time in Canadian history. In Calgary, at the end of the show, as I was leaving the seating area I could hear familiar sound coming out of the speakers. A song by Crowded House, where the refrain sings gently…“hey now, hey now, don’t dream it’s over”. It sounded like hope. Who knows if we’ll ever see the Hip or Gord on stage again. I personally don’t think he Gord is done with his creative output. I think much like Bowie, now faced with his finite mortality, you will see an output of creativity. Gord could be here for years, or minutes. That is the beauty. We don’t know. There is a lesson to be learned there my friends. Not about Gord. About ourselves. Each other. We don’t know. It could be days. It could be minutes. Look around you. Use it up. **disclaimer…I stole the title of this blog after reading fans have been waving banners that say Joined At The Hip on it. I love it.